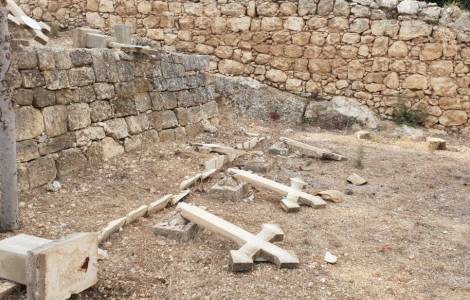 Beit Shemesh (Agenzia Fides) - 28 graves of the cemetery attached to the Salesian convent of Beit Jamal, near the Israeli city of Beit Shemesh, has one again been desecrated by unknown persons. The discovery of the intimidating act was carried out on Wednesday 17 October. It is not the first time that the cemetery of Beit Jamal convent, 30 km west of Jerusalem, has been desecrated. Back in 2013, an incendiary bomb had been thrown at a door of the convent and blasphemous slogans had been written on the walls of the complex. The cemetery area was then targeted in December 2015, when unknown assailants had destroyed the crosses of tombs and some statues. The Israeli police have reported that they have started investigations with all the means available to identify as soon as those responsible of the sacrilegious act. Gadi Gvaryahu, executive director of Tag Mehir - an Israeli NGO that organizes campaigns to support the victims of sectarian hate crimes in Israel - visited the monastery on Wednesday and expressed his solidarity with the Salesian religious. "The Palestinian population in the West Bank", said Gvaryahu to the Israeli media "must be protected from trasgressors, just as Israeli citizens are". Palestinian sources and Israeli human rights groups such as B'Tselem and Yesh Din reported that in the last two months hundreds of olive trees and vines have been found destroyed on land belonging to five different villages in the West Bank. In January 2016 (see Fides 27/1/2016), a group of more than sixty Jews linked to the organization Tag Mahir wanted to express their conviction and shock at the desecration of the Salesian cemetery in Beit Jamal and paid homage to the cemetery where in December 2015 serious acts of sectarian vandalism was carried out. On that occasion, the visitors expressed their solidarity to the Salesians, owners of the cemetery, and wanted to plant an olive tree at the entrance of the religious house.